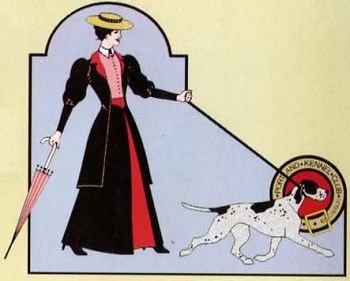 When Portland Kennel Club was first formed in 1893, as with most kennel clubs under the American Kennel Club umbrella, it was a profit-making club, founded by a group of dog enthusiasts in the Portland area. It remained a for-profit kennel club until the late 1950’s, when a large number of kennel clubs, because of AKC encouragement, became non-profit clubs. To show some of the linkage with the elite or power of the Portland community, some of the earliest members were Aaron Frank and Julius Meier [funders of the Meier & Frank Department store, that ultimately morphed in to the current Macy’s Store], members of the Zell family [Zell Brothers Jewelry], Dr. Paul Sabin, and Harry Powell of Garhome Kennels. In 1950, Mr. Harry Powell was Secretary, Show Secretary, and he was also the only active member of Portland Kennel Club. At that time, the American Kennel Club advised him that he would have to take in new members if he wished to continue having an annual Benched Show. It was his decision to step down rather than expand the membership. In the late 1950’s, the ownership (membership) of Portland Kennel Club was advised by the American Kennel Club that they had to become a non-profit club, as well as increase membership. So the monetary assets of the club were divided between the two families, with a token amount left in the treasury for an operating fund. At the same time, new members were added. At this time, Portland Kennel Club was incorporated as a non-profit organization, which it remains to this date. An initiation fee was charged at that time in order to develop am operating fund that was sufficient to put on a dog show. (These fees were to be returned when the club’s cash flow was sufficient.) Portland Kennel Club no longer charges initiation fees, and members pay only small annual dues. Flo Bailey was treasurer of the club until her death, and Doris Lewis served as Show Secretary from 1951 to 1962, when this task was moved to a professional dog show superintendent. Doris served as club secretary for many years, and served in many capacities until her death. In the mid-1980’s, Portland Kennel Club joined with Greater Clark County Kennel Club to hold a two day show, with Friday specialty shows, at a park in Vancouver, Washington. After three successful years, Greater Clark County Kennel Club purchased about 50 acres in Hockinson, and Portland joined them there to form the Brush Prairie Cluster. For many years, Portland Kennel Club, Greater Clark County Kennel Club, Willamette Valley Kennel Club, plus 20-25 specialty clubs on Friday, formed the well-known Brush Prairie Cluster. At the peak of success, the largest show was in the area of 3500 dogs for Portland’s Saturday show. After many successful years, fate struck and the local school district thought the site would make a great high school. With this move by the school district, the Brush Prairie Cluster became highly mobile. From our long time home at Hockinson field, our cluster went to the field of the Clark County Fairgrounds, prior to the construction of the amphitheater on the site. After this temporary site for one year, the Brush Prairie Cluster moved to Oregon, with shows the next four years at the Washington County Fair Complex, where Tualatin Kennel Club joined us. During this stay at Hillsboro, Portland Kennel Club put the Benched Show on “hold” because of the costs involved, and moved our second show to Hillsboro. This worked well until in the middle of the planning of our fifth show at Hillsboro, the Hillsboro announced that they would have an airshow on the same date, across the field at the Hillsboro Airport. With this being incompatible for a dog show, once again the Brush Prairie Cluster was “on the road”, and headed for the State Fairgrounds in Salem. It became somewhat of a joke within the dog show community, as to the Brush Prairie Traveling Road Show, and where it would go next. After one year in Salem, it was decided that Portland Kennel Club needed to return to its roots – Portland. AKC was strongly encouraging clubs to hold events in their home areas, so Portland Kennel Club returned to the Portland Expo Center, and Greater Clark County Kennel Club returned to the relatively newly renovated Clark County Fair Complex. In the late 1980’s, the Portland Kennel Club membership discussed our length of existence, and how to celebrate our 100th Anniversary. Having been founded in 1893 and admitted to membership in the AKC in the same year, reaching 100 years was more than special. Thus began the planning for a major event at the 1993 show to celebrate our 100th anniversary. We knew we would run an exceptional deficit, but we did not care as we wanted to have a “once in a lifetime” event. We had a special medallion cast that was given to all exhibitors at the show, and this was in addition to the regular Portland Kennel Club medallion that was used for Best of Breed wins. Special Benching Ribbons were designed, with a new club logo that reached back to the catalog covers of 1903-1906. Entry fees were dropped although not to the level on 1893. Special events filled both days, and a giant anniversary cake was provided for each day of the two-day show. Press coverage was great, as we featured a look back in time, and all of the events that had faced the world while Portland Kennel Club was holding its shows. WWI, WW2, Korea and Viet Nam were major wars that we survived. The Great Depression and the Stock Market Crash were major events in the United States, but the PKC Bench Show carried on. Dog shows were originally Benched Shows, where dogs were on display all day, with benching being wooden platforms. These areas were for the public to be able to view the different breeds, and ask breeders questions that may help the spectator and potential buyer make the right decision in purchasing a puppy. Gradually, the Bench Show disappeared, until only five are left: Westminster, Philadelphia, Golden Gate, International [Chicago], and Detroit. Portland Kennel Club offered a benched show until about 10 years ago when it became financially not viable. In Unbenched shows, dogs that are entered need to be present only for the judging of their breed or obedience class. As soon as that is done they may leave. Bench shows, on the other hand, require all of the dogs entered to stay on assigned benches the entire time of the show unless they are exhibiting (showing) or exercising or being prepared to show (groomed). The Benched Show added value to the public, as well as to breeders and exhibitors, as it was a great educational opportunity. For spectators, it was an opportunity to walk through the building and learn about the different breeds – temperament, grooming, health issues, etc. – to help decide what would be a good breed for their home. For breeders and exhibitors, there was the opportunity to learn about breeding programs of others, best food for their dogs, health concerns, and much more. For the dogs, it was a socialization opportunity. Leaving the bench prior to the cessation of the show was not allowed, except under exceptional or unusual circumstances. The 100 years plus of Portland Kennel Club Bench Shows bring forth many memories, some good, some sad, and many with an element of humor. Portland Kennel Club would like to express a thank you to the many members, friends and exhibitors who shared these remembrances with us. The Portland Kennel Club Bench Show is gone, but many memories remain.